Lions and tigers and boys, oh joy! 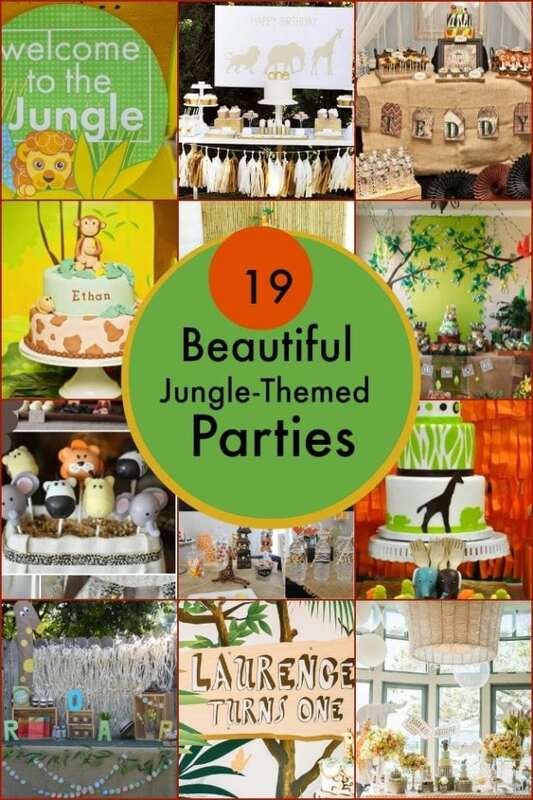 For this jungle safari themed birthday celebration for two brothers, Rita, of Simply Sienna, transformed her clients with party decorations on the wild side of fun! Animal prints and jungle green altered the everyday scenery and produced the most delectable dessert table a safari has ever offered. There are so many great details in this Jungle Safari birthday party. Get wild with this darling safari themed birthday celebration. All this wild fun was captured by Boy Girl Photography. Shades of earth tones and green were the foundation colors for revamping the main living area into a jungle. A pair of long necked giraffes overlooked one end of the dessert table while a subtle leaf patterned fabric panel covered the rest. A pennant in a variety of animal prints calls attention to the centerpiece birthday cake; isn’t it cute? I love the wood slab pedestal that it’s on, too. The three-tiers look like they’re being guarded by the lion and elephant. Darling animal likeness cake pops are the stars on the table, along with animal shaped cookies by Passion for Desserts. Several yummy flavors of cupcakes by Prairie Girl Bakery are in the lineup with Tiger Trifle, Jaguar Jello, macarons, caramels, candies, pretzel sticks and Safari O’s. The “Watering Hole” was cleverly built to look like a grass hut, with beverages in large glass dispensers. The beverage bottles wear burlap and animal print wraps and hold fun, striped straws. Rita used lots of texture in this design; there’s a lot to enjoy. On one end of the table there’s a traveler’s trunk displayed with a globe, binoculars and a camera, so she establishes a mood even with that small vignette; very effective. I also like all of the wood serving pieces coupled with the boxes and metal trunks for display. The burlap table cover adds another texture. There’s also quite a collection of jungle animals used throughout the entire presentation. Even though the desserts are typically what catch someone’s attention, all of these decorative details enrich the party atmosphere. Party activities included photo booth fun, with guests wearing animal masks. There was also a visit with live reptiles–talk about an authentic experience! Guests were also invited to fill their own animal “loot” bags with party treats. If you think your birthday boy might enjoy a walk on the wild side, you’re sure to find inspiration in Simply Sienna’s jungle safari design work.